Polywell Computers Inc. manufactures the highest quality computers. Since 1987, Polywell has supplied the U.S. and international markets with the latest computer systems using quality components. Specializing in manufacturing custom configurations for high-end computers, Polywell offers a wide range of products. Our product line ranges from Mini PCs to Super computers. We also offer Cloud Servers and SAN/NAS/iSCSI Storage products. Products range from Intel®/AMD® Desktop PC to Professional Workstations and Servers. Polywell has built long term relationships with the major BIOS, Graphics and Disk/Controller companies. We maintain a strong technical support. We offer a 5-year labor warranty, and also offer a 30-day conditional money-back guarantee for standard systems. Our company has established its reputation by becoming a recognized leader in personal computing. Our products are regularly reviewed by major publications and we have received numerous awards, such as PC World's Best Buy, PC Magazine-Editor's Choice, Infoworld-Buyers' Assurance Seals. Other reviews in Computer Shopper and Cadalyst Magazine have recognized our products' quality and value. Polywell provides development and manufacturing services to OEM customers as well as cloud network consulting and design support for government, education, corporate and small business. We specialize in E-Commerce for Internet, Intranet and Extranet with custom configurations across Oracle®, Intel® and AMD® platforms. Our diverse product range includes high-end RISC/PC products and cloud/virtual PC/servers/storage. We also build products for Digital Signage, Kiosk, POS, set top box, home entertainment, digital surveillance, IP-PBX, Network Appliance, medical equipments, content creation and CAD/CAM graphics systems. Polywell directly serves government and large corporate customers as well as resellers who work with small businesses that need application support. Internationally, we have a network of value-added reseller partners who bundle Polywell computers with their own solution products and services. We provide our partners with marketing strategies and technical support. Polywell also provides product development, prototype service with our engineering resources in our US and Asia hardware manufacturing and Linux software development team. 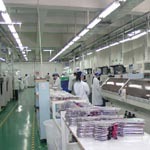 We provide contract manufacturing service for chassis, motherboards, add-on boards as well as complete systems. For details on our comprehensive fulfillment service, click HERE.